The 2011 R&D Teams of the Year  voted for you and by you -- have passion, persistence and purpose. 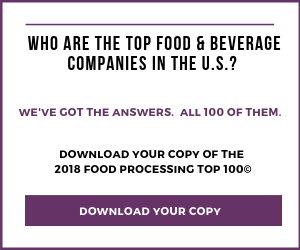 In a tough economy, it is challenging for food & beverage processors to come up with innovative new products, successful strategies and competitive prices to please consumers who seem to be watching every dime. So it becomes even more important to have a great R&D team. With those challenges confronting the industry, in January and February we asked for your participation in nominating the best R&D teams you knew. There were three categories: large ($751 million in sales and greater), medium ($100-750 million) and small (less than $100 million). Finalists were: ConAgra and Unilever North America in the large category; Herr Foods, J&J Snack Foods and Shearer's Foods in the medium-size category; and Blount Fine Foods and HappyFamily in the small group. Then in March and April, we asked for your final vote. Apparently, many of you value innovation, because responses exceeded our expectations: 1,256 votes were cast. Winners chosen by you had many things in common including passion to excel, persistence, purpose, teamwork, understanding of consumer needs, excellent leadership and a corporate philosophy of encouraging individual innovation within the team. After all, according to Babe Ruth, "The way a team plays as a whole determines its success. You may have the greatest bunch of individual stars in the world, but if they don't play together, the club won't be worth a dime." We would like to thank our R&D Team Winners for sharing their successful strategies with our readers. Congratulations also go to their runners-up: ConAgra, J&J Snack Foods, Shearer's Foods and Blount Fine Foods. You ran fine races. And our thanks to all of you who nominated and voted for them. Food Processing is now accepting nominations for its annual R&D Teams of the Year award.